Academy Award Nominations: Best Documentary Feature, Best Song; National Board of Review, Sarasota Film Festival, Minneapolis-St. Paul International Film Festivals: Best Documentary Feature. Six other wins, 40 other nominations. 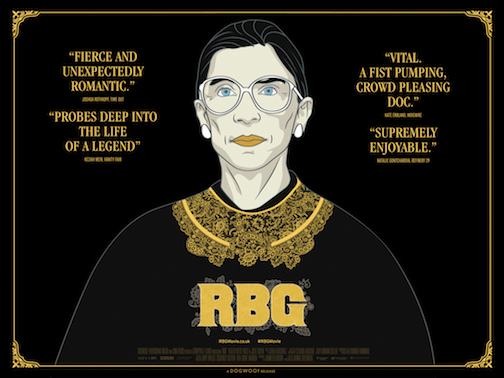 “RBG”, which chronicles the life of Ruth Bader Ginsburg, is a homage by two admiring female filmmakers, but as her story unfolds, one sees why Bader Ginsburg deserves the star treatment. The directors expertly weave the details of a fascinating life, a Brooklynite of humble origins who managed to get into the Harvard Law School in the early 1950s when women were rare creatures, making the university’s Law Review — a coveted position — before using her very fine legal mind to shape the law as a professor and jurist. What emerges is an intriguing portrait of a woman described as shy and retiring but is also shown to be a work horse and a master legal strategist. The film gives due credit to her late husband, Marty, a successful tax lawyer who supported her at every turn until his death in 2010. The story also shows the progress of U.S. society, legally and socially, over several decades to the present day where Bader Ginsburg finds herself the best known dissenting voice on an increasingly conservative court, something which has earned her cultural touchstone status — i.e., Notorious R.B.G. The canny judge’s sole misfire: publicly criticizing then-presidential candidate Donald Trump. No doubt Trump and company would love to see the last of her. But Bader Ginsburg, who has survived two bouts of cancer and works out regularly at the gym, is tougher than her diminutive form would suggest.